The problem is that we don’t know when any of the DSC ships were constructed. We start out 200 years before with the Phoenix’s round nacelles. Then 100 years later we get the NX class, Intrepid type, Warp Delta type, ECS freighters, etc., all with round nacelles. Then 90 years after that we see the majority of Starfleet ships with angular boxy nacelles, including what seems to be a brand-new class (Crossfield) with the same boxy nacelles. But then a monkey wrench is thrown into the mix with the Constitution class. When was this class constructed relative to the other DSC ships? And if it is a contemporary to those ships, why does it have round nacelles when every other ship shown doesn’t? saddestmoon and BillJ like this. I don't know, it works for me. The Constitution is an older ship, and could represent the last gasp of the older tech taken to it's extreme but still offering excellent performance. They're also generally deployed further out (from dialogue in Discovery) so might have fewer opportunities to upgrade than the newer ships or those closer to home, and in any case the newer nacelles might have marginal gains in themselves. The first opportunity to upgrade the Constitution fleet was the Enterprise's return, which allowed for a holistic upgrade of the entire ship. But again, older in relation to what? 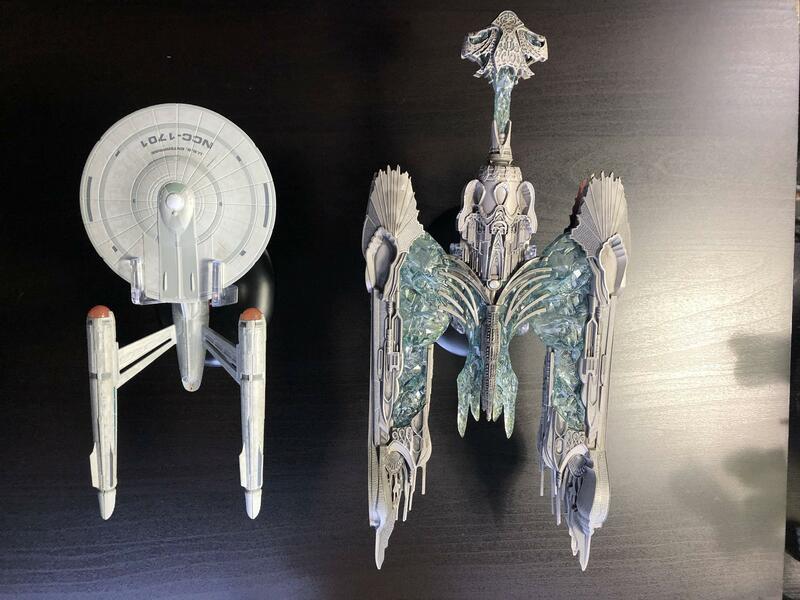 Is it older or newer than the other DSC ships? And how old are they? Registry numbers do not connote age in this case, so there's really no way to tell. 1. Are the Star Trek: Designing Starships Vol. 1 books on the eaglemoss shop the same content as the Star Trek Designing Starships Volume 1: The Enterprises and Beyond ? 2. Is there a different magazine for the regular E-F and the STO colored E-F or are they the same? Yes, they're the same, at least for the first 2 volumes. Rahul, King Daniel Beyond, saddestmoon and 2 others like this. Looks like the Klingons dressed it up to go trick-or-treating. immaturity aside, that is one large ship of the dead. Daddy Todd, saddestmoon, pst and 2 others like this. Maybe it kind of does if you headcanon it as an ancient Hur'q vessel. Markonian, 137th Gebirg and pst like this. Funny, I was just thinking how Klingon it looked. Head/bridge section, neck leading back to the main hull, and engine nacelles attached. It looks like an old ship with those giant nacelles probably resulting from a more primitive technology over-engineered to the limits of its capability. Once you strip away the ornate cladding, there's probably a perfectly credible early-22nd century battlecruiser in there. Markonian, ATimson, saddestmoon and 2 others like this. Exactly what it reminds me of. Yeah... maybe... I kind of see that but man it still just doesn't do it for me. Very little in Discovery has gotten Klingons right as far as I've seen. there's so much transparent plastic here, it's like eaglemoss saved up all the clear parts they should've included in the bussards and warp field grilles in their previous releases, melted them down, and used the material here. it's not my favorite design in the world, but it's got that distinctive battlecruiser shape, so it definitely says klingon to me. yup, that's my take on it too. Markonian and CommanderTrip like this. The Discovery Enterprise showed up today. Impressive model. Glad I ended up going with this one instead of the XL version. CommanderTrip, pst and saddestmoon like this. Splurged a little and ordered the regular sized NX-01 and Enterprise-E from Amazon. I've gotten some off ebay. If you live in a big enough town that you have a comic/collectible shop or two, I suggest giving them a call. They might carry some of the re-releases of the "hero" ships that came out last year. And yes, Fuller told the Klingon ship designers to ignore the previous series/movies designs. I think that's rather unfortunate. The lack of design continuity with the other series in terms of ships, make-up, sets, and uniforms are part of the reason I still haven't checked out the show yet. (That and the fact that I feel like the mirror universe and Section 31 have become tired cliches by this point). In the past, I've pointed to the film "Rogue One" and how a film from 2016 can use designs from from the late 70's/early 80's and still look good and look like it fits within the era of the original trilogy. Discovery looks as different from TOS as TNG did, but the latter show had the excuse of being set a century after, not a decade before. I don't mean to be yet another one of those online haters, bashing the show for anyone who enjoys it. I'm just stating my problems with it. With the exception of Voyager, which was probably meant as more of a science vessel, most post-TNG 24th century ships have a harder, more militaristic look to them. I think this makes sense if they were designed after the introduction of threats like the Borg and the Dominion (whereas the Galaxy and Nebula classes seemed to have been designed in a "golden age" of peace for the Federation). Some are certainly better than others (I prefer the Akira and Saber to the Norway and Steamrunner) but there's none I actually dislike. My only nitpick with the "First Contact" ships (and this may indeed be a nitpick, since you can't really see them on-screen) is that I thought the registry numbers were far too low, making them older than any of the Galaxies we've seen. I wish they'd had numbers more contemporary with the runabouts, Defiant, Voyager, and Equinox to help sell the premise that they are newer designs too. 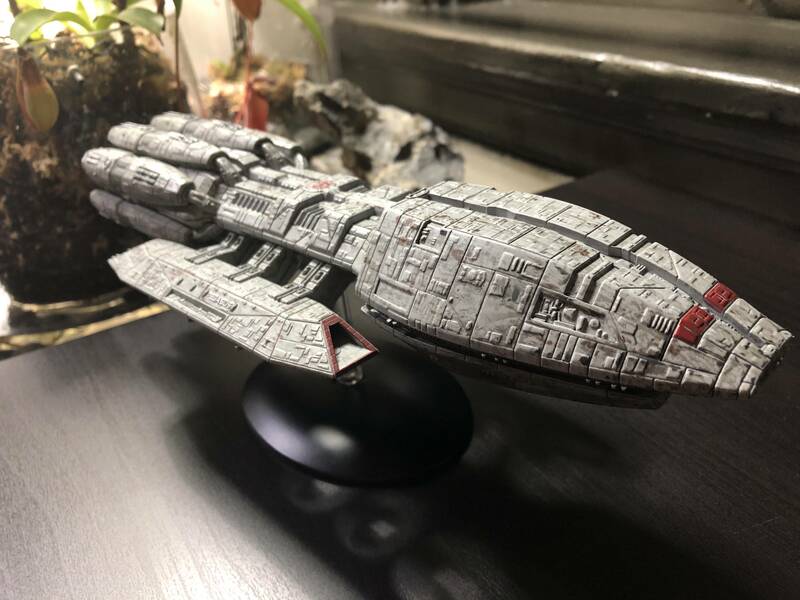 I've been thinking of getting the Voyager concept ship from the online store, but $42 CDN, plus shipping is a bit much for me (especially since I just spent two weeks racking up credit card debt in foreign countries), but I figure it wouldn't be so bad if I got a second ship and thus free shipping. Unfortunately, none of the other ships I'm interested in (Bonaventure, Enterprise-F, Cheyenne) are currently in stock, so I guess I'll have to wait. Markonian, Rahul and mindx2 like this. First of all: Thank you again for sharing all these nifty pictures! At this point you're probably the backbone of this entire thread already. Also, that's a really faithfull model of a really, really intricate (and thus difficult to make) weird ship. 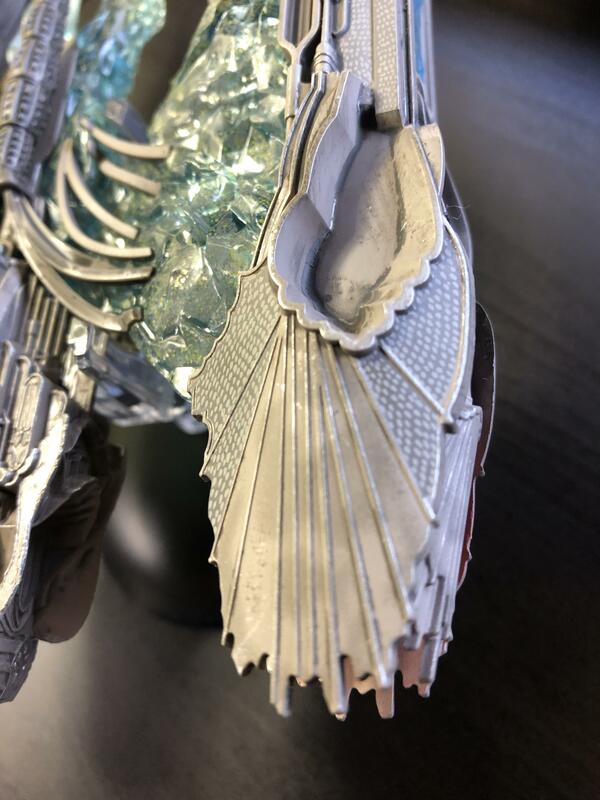 The parts that eaglemoss made transparent already looked weird in the concept art and the CGi model. 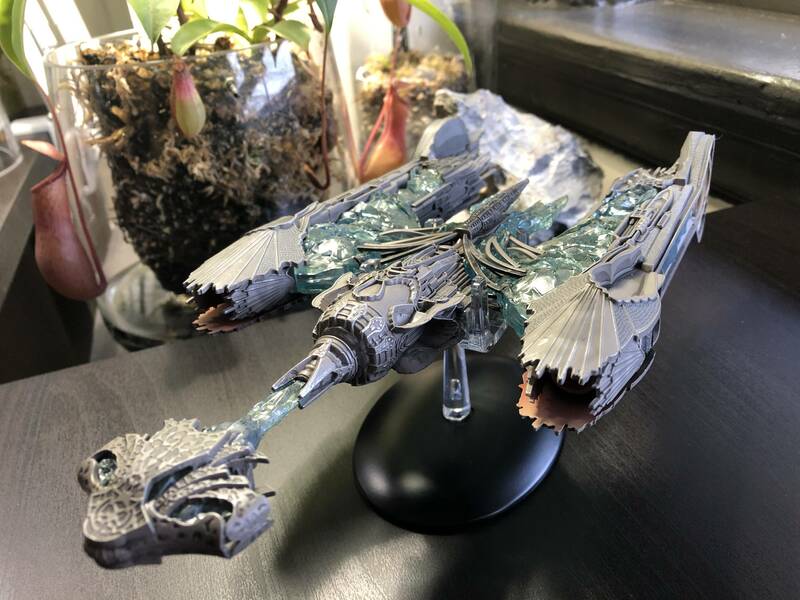 As far as Eaglemoss is concerned, they really did a helluva' job with this one. Despite that - as the type of guy that actually has model starships myself - I look at this model as personally detached as to someone else's football memorabilia model, or stamp collection. Like - I just don't get it. I don't have any connection to it whatsoever, not emotionally through the stories, nor as a piece of design on itself. I'm not as big a fan of the DISCO-Enterprise either - but I could absolutely understand everybody that is and wants to have one. But this one? I just don't get it. pst and mindx2 like this. I look at this model as personally detached as to someone else's football memorabilia model, or stamp collection. Like - I just don't get it. I don't have any connection to it whatsoever, not emotionally through the stories, nor as a piece of design on itself. Michael and Tomalak like this.